Ah, martial arts...Meng Fei, Jackie Chan, Kung Fu, ninchakus, Karate, flying kicks and passing fads, seeds sown in films by Golden Harvest, then notorious for unsynchronous English dubbing. Things changed when Hollywood took notice and saw Bruce Lee bent like a letter S with 2 vertical bars across him. I guess kung fu movies are good promotion for martial arts schools. Aged thirteen and in the company of hyperkids I foolishly bruised my knuckles on a silly wooden post with rope wound around it. Karate was buzz word at that time much as rap would be today. Bruised knuckles were status among my peers. Layers upon layers of healed and dead skin protrude with attitude on closed fists; and callously called idiots by neighbourhood cynics. "Aw, stuff the adults and their boring boxing!" I said to myself then. Highschool fights were settled with flying kicks accompanied by blood-curdling "Eeeeeyaaaahh!". Hordes of students often march to nearby Paco Cemetery to settle scores. Mediocre and young school bullies were replaced by senior Robin Hood-type guys who knew Karate and yet excelled academically. Back home It was like every kid in Pasay was practising monkey and crane-styles in the Shao-Lin ground (aka basketball court). Temples (and cheekbones) sometimes hit by careless swings, often knocked a kid out dizzy in a mock kung fu fight. Drunk-style was town's favourite with the grog/variety store open all night. 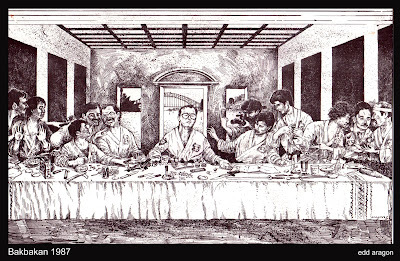 In the late 60's I had a stupid necktie around my collar as artist-clerk (a very rare job;-) in the personnel department of United Laboratories in Mandaluyong. During office breaks the staff got Judo lessons for employees. Anyway that was before the Marcos-crony freakhead of a management sacked me for organising a labor union; after which Judo made Judas out of some rank-and-file guys who betrayed friends to keep their jobs. Then Australia. 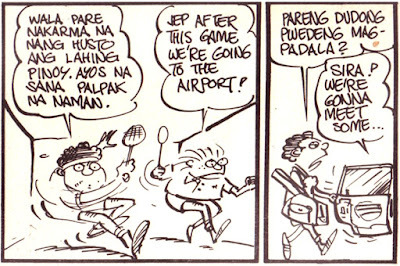 First thing I did was sketch life of a Filipino immigrant (in 1979, there were just a few Filipinos around). After a while I created Jep, a comic character that told stories. 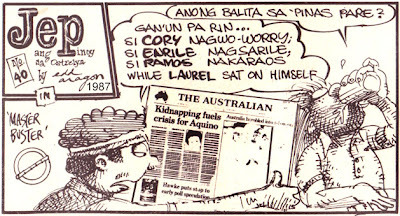 It was published monthly in various Filipino-Australian newspapers. 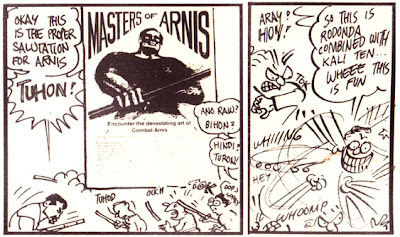 Later on I compiled the comics into a book which was published in 1985 by Rey Galang who at that time was our martial arts instructor in Sydney. I rarely see him as he's always traveling. He stayed for a long time in Washington, then travels to and from Manila and Sydney, much like a parade review of Bakbakan martial arts schools he has established around the globe. 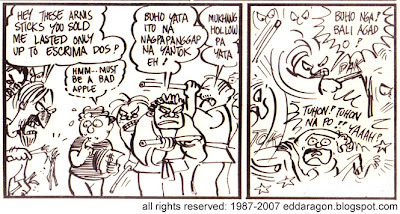 Sensei Rey just breezed in from Brissy (Brisbane) so I've interviewed him for Bayanihan News and has included it in this blog entry which I peppered with Jep comics and images from the days I was so active in arnis and sagasa style of martial arts. Art and Literature aside from being part of our high school days are also part of being human. Man’s fascination for self-expression come in many forms. Sometimes guilty myself I forget about a kind of art that helped our lot survive the imperial greed of ancient hordes of foreign armies. Like digital to analog, Samurai warriors where edged out by Gutling machine guns. Superior weaponry and technology became standard as who-gets-what in this new world. 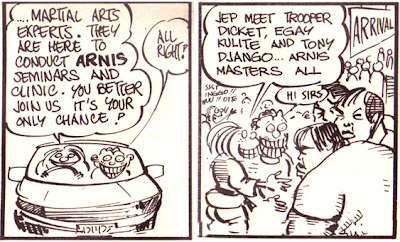 However owning a big gun and brandishing it at opponents armed only with a pair of rattan sticks doesn’t necessarily make one a gentleman; au contraire the former becomes a barbaric Neanderthal in the field of martial arts, particularly our own brand from Arnis to Sagasa to knife-fighting. Violent huh? Well, the term is generic until the intention of threat is applied. Many of us believe man’s aggression and fighting skills were born out of the will to survive (despite unwillingness to hurt another in self-defense). Australia is lucky to have an adopted son, (Master) Rey Galang, one of a few Filipino martial arts instructors intent to promote the legacy of our brave fighters and to preserve it, both in active culture and archival forms (e.g. books), for the next generation of peace-loving Filipinos and Australians. I’ve known Rey way back in ’84. 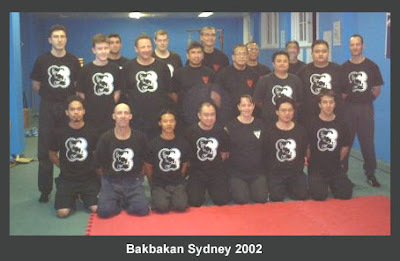 He set up Bakbakan (style of fighting) decades ago, one of the first Filipino martial arts school in Australia. We initially practised weekly at Karuah St., Doonside, all of us donned in white kimono and a rainbow of belts. We were put to the test by three other Filipino master instructors, namely; Christopher “Toper” Ricketts, Tony Diego and the late Edgar Zulite. Guests came in to spar. Punching bags are often not too friendly. I’ve injured my drawing hand many times for timing mistakes. I’ve also videoed Sagasa and arnis lessons for the group while my mind was constantly assaulted by the thought of losing my wife to cancer. She lost the battle but in her I saw the will of mankind to fight to survive. The other day, Rahneer Fahbi, a Bakbakan martial arts instructor, dropped by my place and surprised me with a companion at the door. EA: Hello Sensei Rey, fresh from Brisbane? RG: Hi Edd; yes I just came back from Brisbane personally pursuing my career as an Analyst Programmer. Contract is finished so I’m now back here in Sydney. EA: Is it an Australian firm? RG: Actually, Queensland Gas Corporation. They were converted to SAP so we assisted in their migration. EA: What’s up with the martial arts scene here in our Filipino-Australian community? 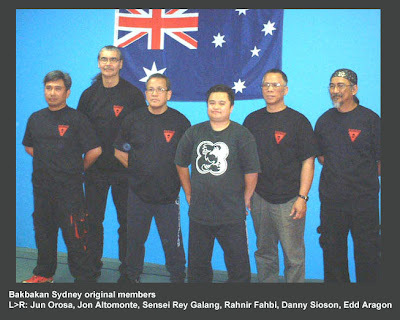 Are we gearing towards upping the ante in the Filipino-Australian scene with regards to the martial arts? RG: Actually with the publication of the many books that I have written, we have raised the standard. We have literally raised the bar, and it has come to a point that when they see the Bakbakan logo on the book, they know that it is Filipino martial arts, and that it would be of good quality, a research material. EA: Did you have to sort of shuttle different followers of Martial Arts here, into something to polarise them under one Filipino Martial Arts banner? RG: Basically, we always try not to isolate the different styles, that’s why we put them under one banner- Filipino Martial Arts, which has its own favourite forms of combat. There are four books that I have now out in the market, beginning with the Complete Sinawali, published by Tuttle Publishing in 1999, - that created an impact because it was the first comprehensive study of the double street fighting art of the Philippines. That was followed later on in 2003 by Classic Arnis which was a study of the legacy of Placido Ambao, one of our legendary Arnis fighters and instructors from the Manila area. 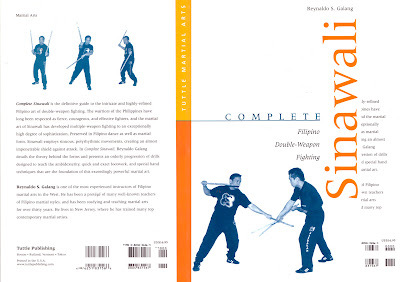 It was followed by a Compendium of many Filipino martial arts style in the book Warrior Arts of the Philippines – a book that covered not just Bakbakan which is always there, my mother art, but we also have Balintawak, Modern Arnis, Doce Pares, we have the San Miguel Eskrima, and we have a lot of other styles. Then there is Masters of the Blade. EA: These books you’ve written and published, can they be considered as school or college manuals where anyone can easily comprehend and follow what the illustrations or writings there are? RG: One would have to have some background to be able to follow it as is. They were not meant to be self-teaching manuals, but as reference for those who are already in the game, and also a collection of trivia and history of the other styles. EA: Something like a Martial Arts infotainment type of book? RG: Yes, sort of, but at the same time, it also preserves the history and the legacy of the arts. EA: Of course we would want to contribute something to Australia. Do we have a lot of competition with other types of Martial arts like say the Korean’s tae kwon do or Chinese Kung Fu? 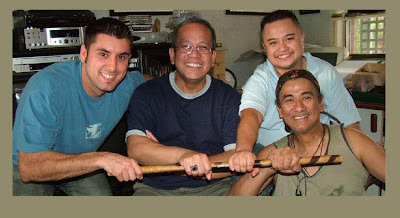 RG: Basically, in the realm of stick fighting, Filipino Martial Arts is at the top of its form. Once you mention stick fighting, the idea that comes to mind is not the Japanese style or the Korean style, but the Filipino Martial Arts. EA: That’s good to hear that we have a Filipino signature. RG: Yes, that’s our signature. EA: Would there be some good batch of philosophical instructors reading your books for the Y generation to continue on the legacy? RG: I think most of the purchasers of the books are from the boomer and the Y generations, as well as generation X, because the good thing about the books, especially Martial Arts books, is that it never gets outdated. It goes from generation to generation, preserved, modified and enhanced but still it retains its identity. EA: What would you consider the mainstream Martial Arts form here in Australia? RG: Right now, I think the popular one is mixed martial arts which includes kick boxing and grappling. EA: Is this a good trend? EA: I didn’t mean to be too generic but can we put them into 3 envelopes, with one written “for security forces”, will include security guards, navy, police, army; second envelope “for kids” to protect themselves, and third “for fitness”? Do you combine all these into one folder to say, teach bakbakan? RG: We try to. The envelopes are actually the degrees of interest of the individual and we don’t push them, we don’t require them to go into envelope one, two or three, it is up to them and their needs. EA: What are you doing to promote your books and the martial arts? RG: Well my books are basically self-promoting in the sense that a lot of book dealers have them on their shelves - even in the Blitz Martial Arts magazine, Amazon.com and bakbakan.com. A lot of people order theirs from Amazon because they are offered a hefty discount. EA: Any martial arts vision 10-20 years from now? RG: I want to see the trend of the Filipino martial arts to continue – that it is progressing and assimilated into the mainstream culture of Martial Arts all over the world. 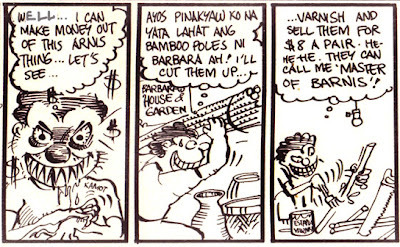 Right now, Bakbakan itself has franchises in US and Canada. In Australia, we have a branch here in Ashfield and moving to Marrickville. Other than that, we are also organising in September a tour for Brisbane, Melbourne and Adelaide, to introduce or re-introduce Bakbakan. EA: So definitely Pinoy martial arts will and always be part of global scene. I think that has been happening, not only in the movies. But of course Danny Inosanto was one of Bruce Lee’s teachers and aside from that there are other guys – can you mention other Hollywood type of characters that have been touched by heroes of Filipino martial arts? 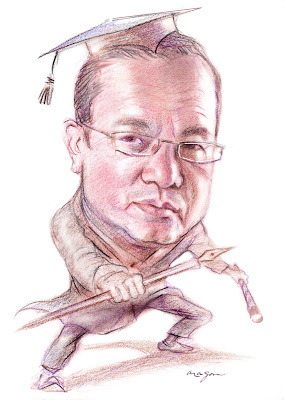 RG: They have a lot of martial arts In Bourne Identity and in the Matrix. There was also a movie with Ernie Reyes Jr - there’s so many of them – its becoming too common. In the movie the Hunted – the Filipino knife fighting was featured. EA: Did you think that martial arts is not a career but a lifestyle? RG: Martial arts is a lifestyle for the soldiers, for the military, that’s what they are there for - to protect and defend. But for the ordinary citizen, martial arts is a way of discipline, of keeping fit, a way of relieving the stresses of day to day. EA: Is it another form of yoga? RG: Yes, you can call it that, or tai-chi, or anything that involves discipline that makes you go through rituals, routines that help. EA: Any word for our young Filipino-Australians? RG: I hope that like their American counterparts, they will go about seeking their culture and discover many arts that are indigenous to the Philippines and take pride in practising it. EA: What are you working on now? RG: I’m working on the next books, Guardians of the Legacy and the Way of the Phoenix – a compendium of Filipino martial arts, but concentrating on the masters and leaders of the art, people that will be carrying the banner. EA: Thanks Sensei Rey. Mabuhay ka at ang Filipino martial arts!